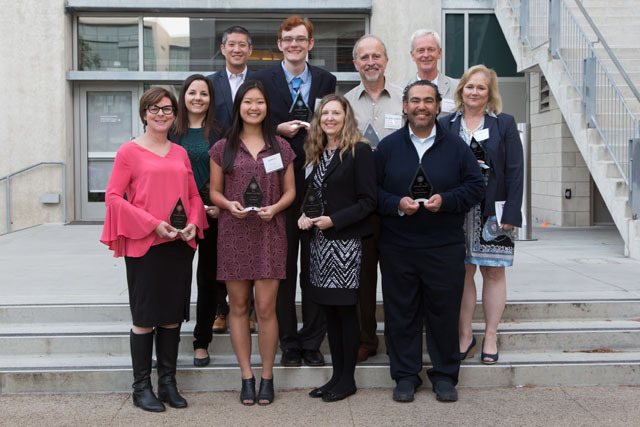 On April 18, UC San Diego community members were recognized at the 8th Annual Integrity Awards Ceremony for their contributions to academic, research and professional integrity on campus. The awards honor our university’s commitment to uphold the six pillars of integrity—responsibility, honesty, fairness, respect, trustworthiness and courage. One of UC San Diego’s key contributors to campus integrity is the Academic Integrity Office, which promotes and supports a culture of integrity in order to reinforce quality teaching and learning, teaching students ethical decision-making skills that can be applied in all aspects of life. This year, the Integrity Peer Educator Program was also recognized at the ceremony. Peer Educators are the daily integrity champions on the campus, volunteering to help educate students, advise students and promote an integrity of culture across campus. Over the last ten years, the program has grown to 45 peers, and boasts over 70 alumni who have served in the program. The Integrity Peer Educator Program is recognized around the globe for both its contributions to the integrity culture at UC San Diego as well as for the leadership development it provides to students. In 2011, in partnership with the Integrity Peer Educator Program, the Academic Integrity Office established the first award ceremony to celebrate members of the UC San Diego who uphold integrity in new and inspiring ways. The ceremony was expanded in later years to include awards for research and professional integrity, recognizing individuals who embody integrity in areas other than academics. Recipients for this year’s award were chosen by a review committee comprised of faculty, staff and alum based upon their demonstration of six criteria. These included conducting research on, promoting and mentoring others in, volunteering time in service of, institutionalizing and/or exhibiting courage in defense of integrity.